The BBA’s Pipeline & Recruitment Committee of the Diversity & Inclusion Section welcomed 24 diverse law students to the Summer Judicial Internship Program at last night’s orientation meeting. Judge Tochka and Judge Ronquillo, both of the Boston Municipal Court, who have spearheaded this initiative at the BBA offered students tips for working in the court system and making the most of their summer internship. Pipeline & Recruitment Committee Co-Chairs Angela Gomes (Skadden, Arps, Slate, Meagher & Flom LLP & Affiliates) and Mia Friedman (Rappaport Center for Law and Public Service Suffolk University Law School) shared information on the Diversity & Inclusion Section and its programming. These Judicial Interns students will work alongside judges in the Boston Municipal Courts, District Courts and Probate & Family Courts. In addition, interns are invited to engage in weekly professional networking meetings held at the BBA. 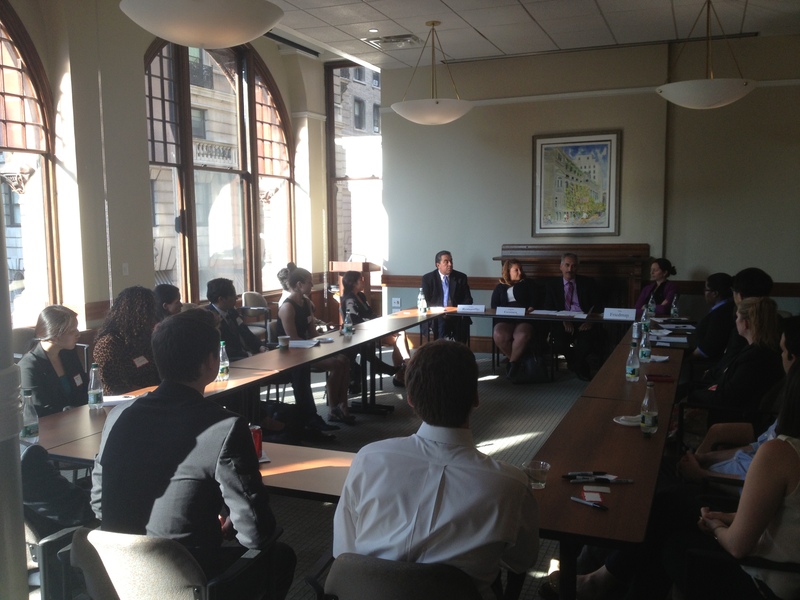 Judicial interns attended an orientation last night at the BBA. The interns will be working in the Boston Municipal Courts, District Courts and Probate & Family Courts this summer. Susan Finegan (Mintz, Levin, Cohn, Ferris, Glovsky and Popeo, P.C. 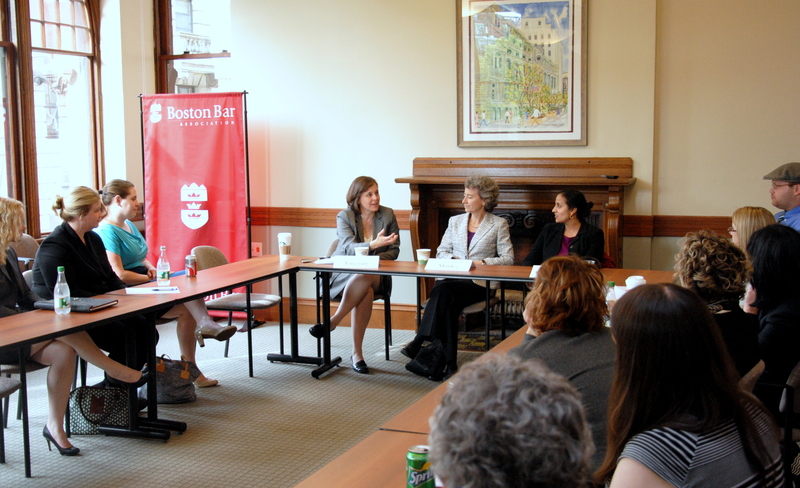 ), Honorable Maureen Monks (Middlesex Probate and Family Court), and Manisha Bhatt (Greater Boston Legal Services) discussed how their commitment to pro bono and public service work has shaped their careers. Last night, the BBA’s Family Law section held a roundtable discussion at the 16 Beacon Street discussing ways pro bono work can shape your legal career. Three pro bono connoisseurs, Honorable Maureen Monks (Middlesex Probate and Family Court), Manisha Bhatt (Greater Boston Legal Services) and Susan Finegan (Mintz, Levin, Cohn, Ferris, Glovsky and Popeo, P.C.) served as panelists and shared their personal experiences with the audience and discussed ways for others to get involved. The months of May and June mark the overlap of the incoming and outgoing PILP classes. We wanted to use this time to reflect on the good work done by the members of PILP class of 2012-2013 and hear what they enjoyed most about the program. Stay tuned for feedback from other members of the class. For more information on the Public Interest Leadership Program, please contact Susan Helm, Member Programs Coordinator, at shelm@bostonbar.org. 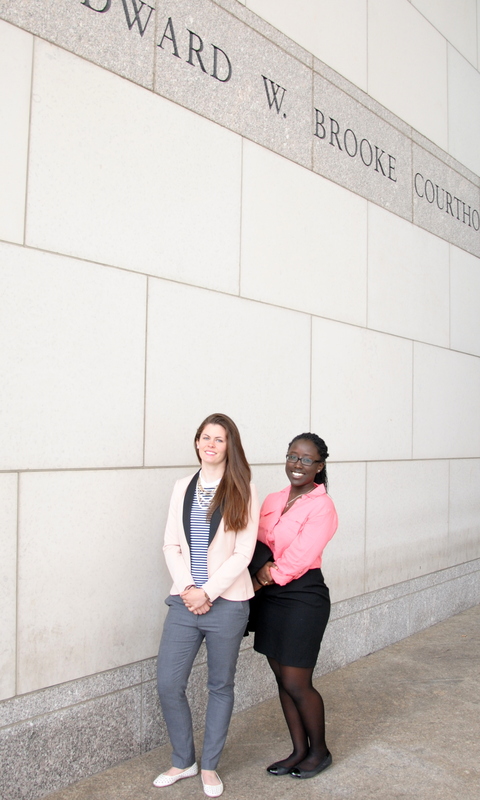 BBA Co-op students Alixandra Powers and Gaciru Matathia visited the Boston Housing Court last Thursday. Gaciru Matathia is working in the BBA Lawyer Referral Service until the end of June. Gaciru studies International Affairs, and is pursuing a minor in Social Entrepreneurship. 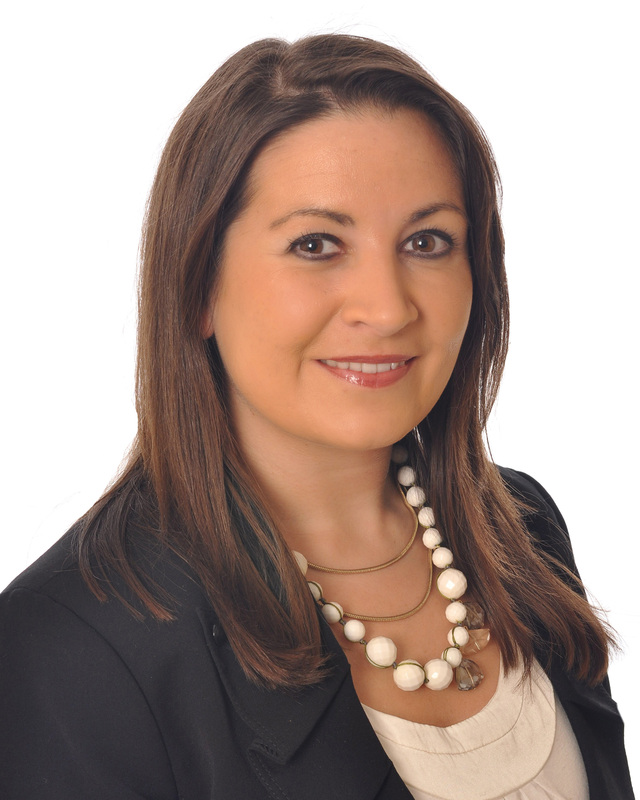 Alixandra Powers is working in the BBA Membership Department until the end of May. Alixandra is a History major, and is a cadet in the school’s ROTC program. She hopes to attend law school after graduation, and is interested in becoming a Judge Advocate General (JAG) in the Military. 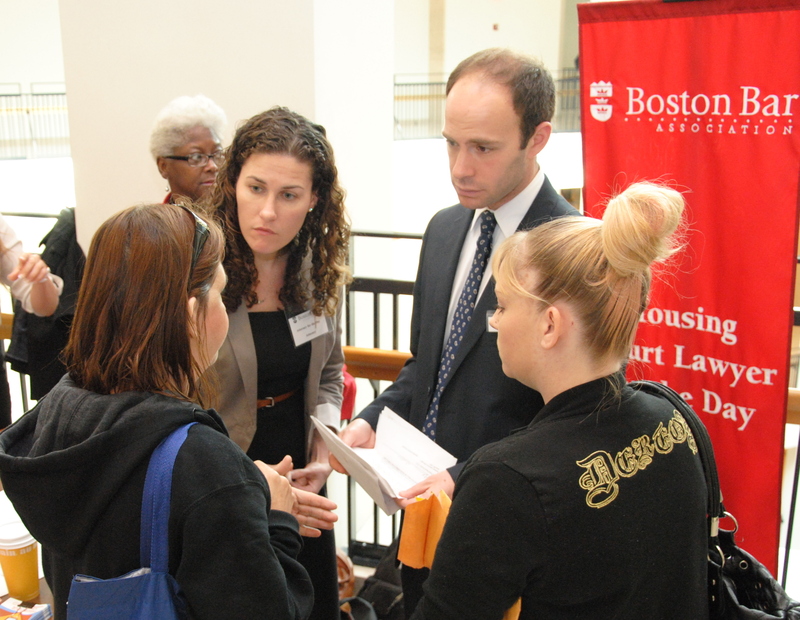 Volunteers provide legal advice to landlords and tenants as part of the Lawyer for the Day in the Boston Housing Court Program. For more information on the Lawyer for the Day in the Boston Housing Court Program, please contact Katie D’Angelo, at kdangelo@bostonbar.org. With the help of 41 volunteers, the Law Day in the Schools Program taught 782 Boston public school students about the issue of equality. Beyond the Billable would like to acknowledge the attorneys who volunteer their time to make this program possible. 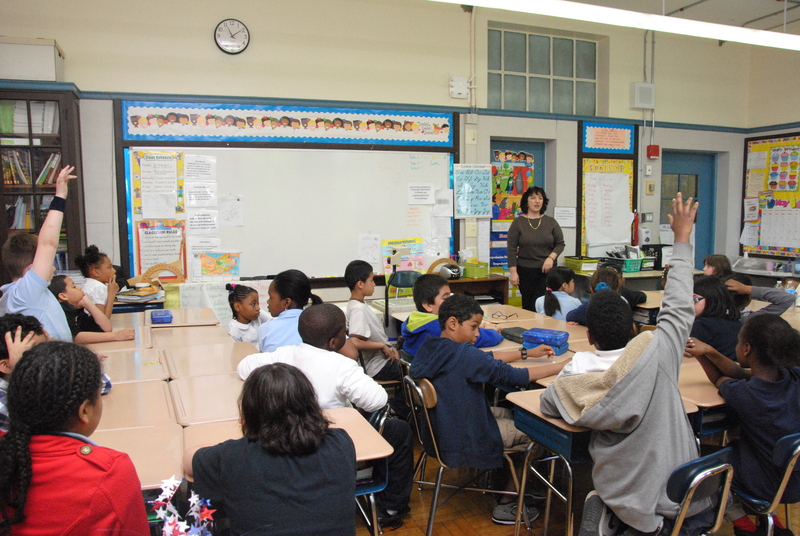 Volunteer Attorney Michelle O’Brien (Mackie Shea O’Brien, PC) asks students in Mr. Lyndon’s 5th grade class at Josiah Quincy Elementary School what lawyers do. Peter Berry, Deutsch Williams Brooks DeRensis & Holland, P.C. Veronica Contreras, Biogen Idec Inc.
Matt Iler, Law Office of W. Matthew Iler, Jr.
Joe Keeney, Biogen Idec Inc.
Igor Novikov, Law Office of Igor Novikov, P.C. Jennifer Sieczkiewicz, Biogen Idec Inc.
Amy Zahler, Biogen Idec Inc.
For more information on the Law Day in the Schools Program, please contact Katie D’Angelo, Public Service Programs Coordinator, at kdangelo@bostonbar.org. 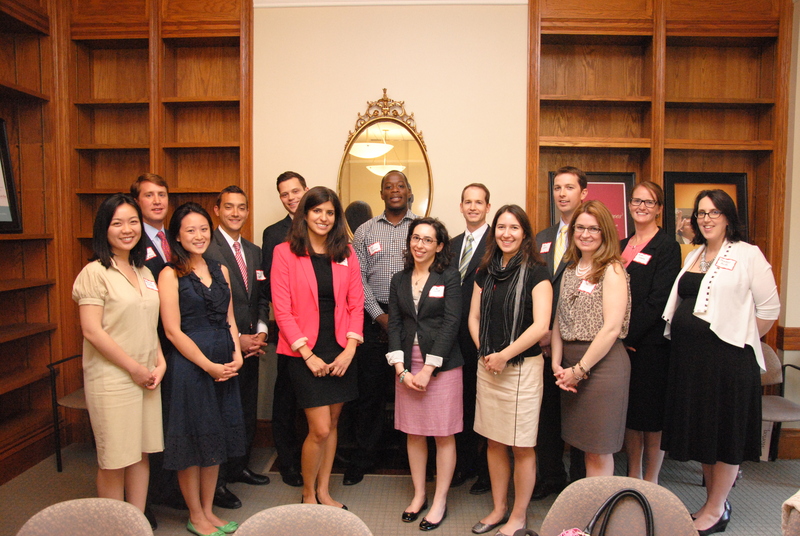 Last night, the BBA welcomed 15 highly qualified new leaders to the Public Interest Leadership Program class of 2013. This year’s class comes from a variety of backgrounds, including government, law firm, in-house legal departments, academia, and legal services. At the orientation, new class members were introduced to BBA leadership and staff, as well as members of the outgoing PILP class at a roundtable discussion about leadership and public service programming opportunities available through the program. 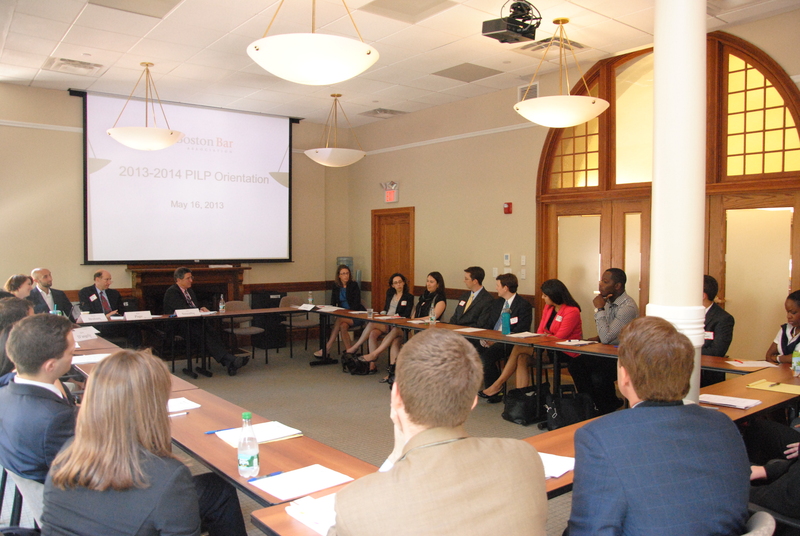 The new PILP class attended orientation last night to learn more about what to expect in the upcoming program year. After the program, past and current “PILP’ers” had a chance to connect with classmates and network with PILP alums. The nine previous PILP classes have produced an alumni network of over 100 leading lawyers. The PILP programs brings together a group of lawyers from various backgrounds who share an interest in public service and leadership development. Stay tuned to hear more about what this PILP class has in store for the year ahead. 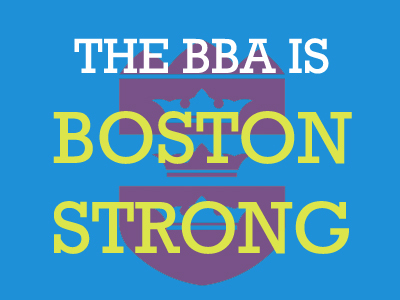 For more information on the Marathon Monday Project, please contact Katie D’Angelo, Public Service Programs Coordinator, at kdangelo@bostonbar.org. Last night, Judge Jeffrey Winik was honored with a Citation of Judicial Excellence for his leadership as the First Justice of the Boston Housing Court. In this role, Judge Winik has dedicated himself to advancing the Lawyer for the Day in the Boston Housing Court Program, which he describes as “access to justice in action.” Volunteer attorneys help provide legal advice and representation to landlords and tenants. Approximately 90 percent of tenants and 50 percent of landlords are unrepresented. Since the program began 14 years ago, 12,000 volunteers have helped more than 14, 500 individuals. However, the sheer volume of cases—the housing court can see about 200 eviction cases on a single day—calls for additional volunteer attorneys. I guarantee you, you will come away from the experience knowing you have done something important and have helped people who would have been far worse without your assistance. Lawyer for the Day in the Boston Housing Court is the epitome of a meaningful pro bono opportunity. Just a few hours on a Wednesday or Thursday can make the difference between a family losing their home or a landlord being foreclosed on. Volunteers can participate individually or with their firm. Volunteers will be trained and supported by staff attorneys from the Volunteer Lawyers Project, Greater Boston Legal Services and Legal Services Center of Harvard Law School during the volunteer session. 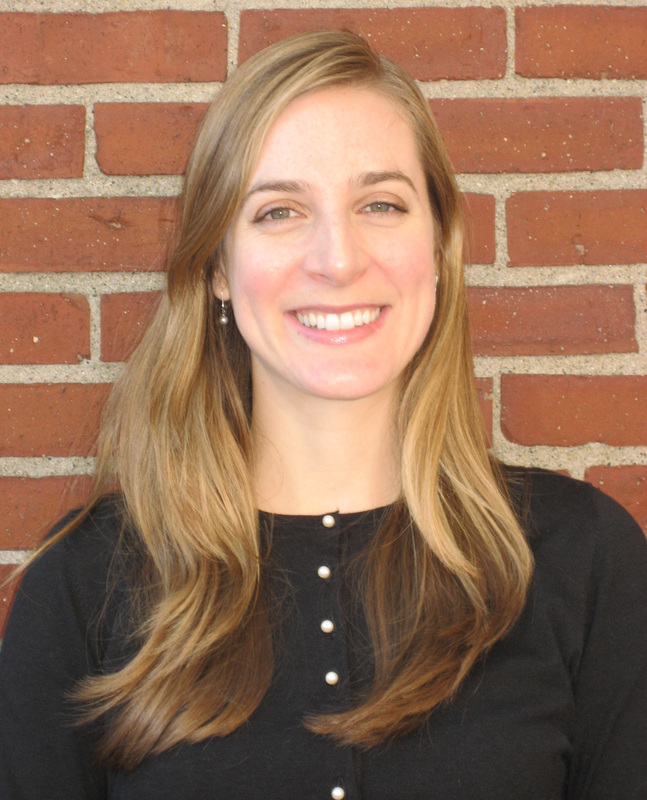 Interested volunteers should contact Katie D’Angelo, Public Service Programs Coordinator, at kdangelo@bostonbar.org for more information about ways to get involved. 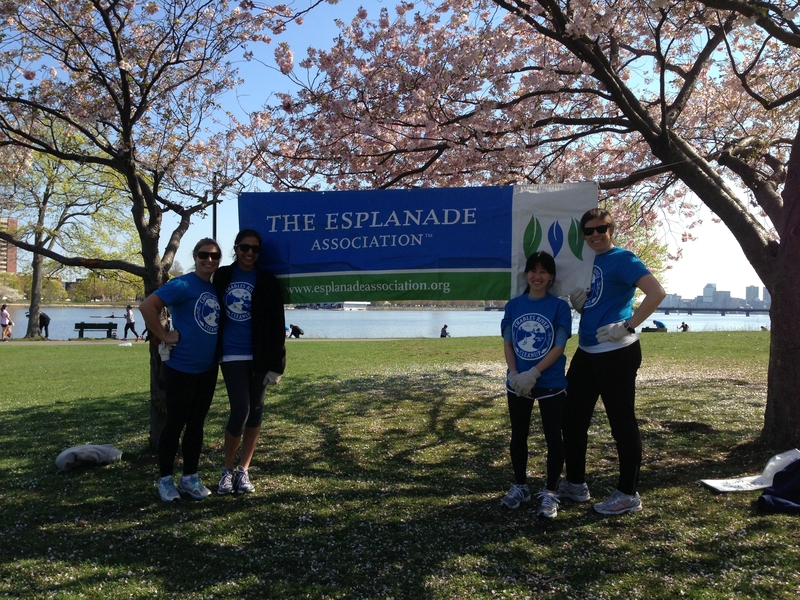 The Environmental Law Pro Bono Committee and the New Lawyers Public Service Committee have been busy coordinating environmentally focused volunteer opportunities in honor of Earth Day last month. Twenty-one volunteers put on their work gloves to help remove debris and trash from the banks of the Charles River on April 27th for the 14th annual Charles River Clean Up. A week later, eight volunteers spent the morning of May 5th at the Gladeside Urban Wild, one of the largest undeveloped areas in Mattapan. Volunteers helped to maintain this open space by removing invasive plant species, preparing the land for future plantings, and performing spring cleaning. Volunteers Sara Farnum (Massachusetts Office of the Attorney General), Smita Deshmukh (Sullivan & Worcester LLP), Stephanie Pan, and Margaret Caulfield (Partners HealthCare) helped remove litter and debris from the banks of the Charles River as part of the 14th annual Charles River Clean Up on April 27th. 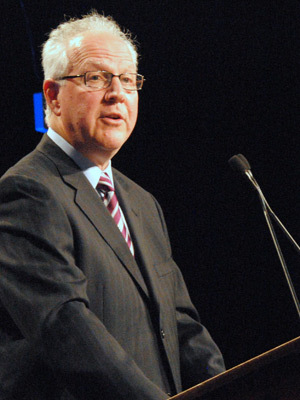 Phelps Turner (Sugarman, Rogers, Barshak & Cohen, P.C.) 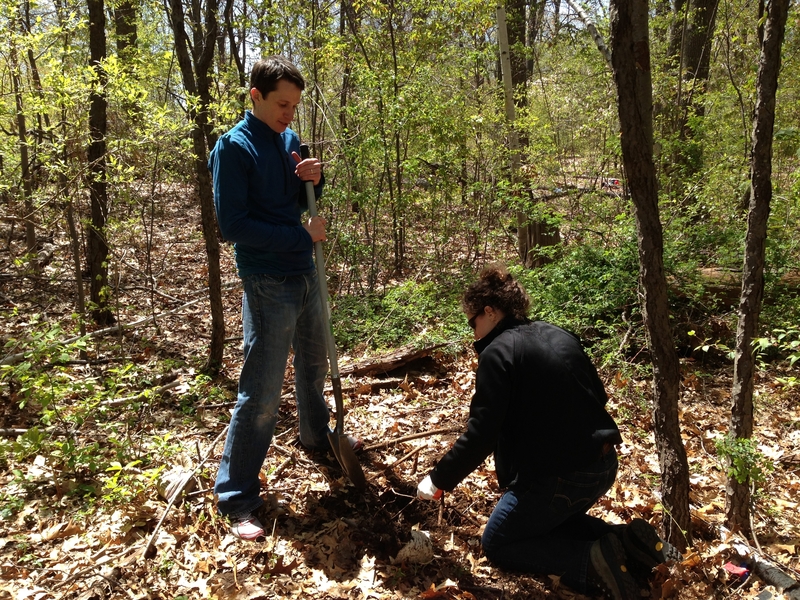 and Staci Rubin (Alternatives for Community & Environment) planted a tree in Gladeside Urban Wild in Mattapan. Volunteers Jennifer Rushlow (Conservation Law Foundation), Danah Tench (Massachusetts Department of Environmental Protection), Pamela Harvey (Massachusetts Department of Environmental Protection), Phelps Turner (Sugarman, Rogers, Barshak & Cohen, P.C. ), Ben Ericson (Massachusetts Department of Environmental Protection) and his son, Staci Rubin (Alternatives for Community & Environment), Michele Hunton (Lawson & Weitzen, LLP), and Lisa Goodheart (Sugarman, Rogers, Barshak & Cohen, P.C. 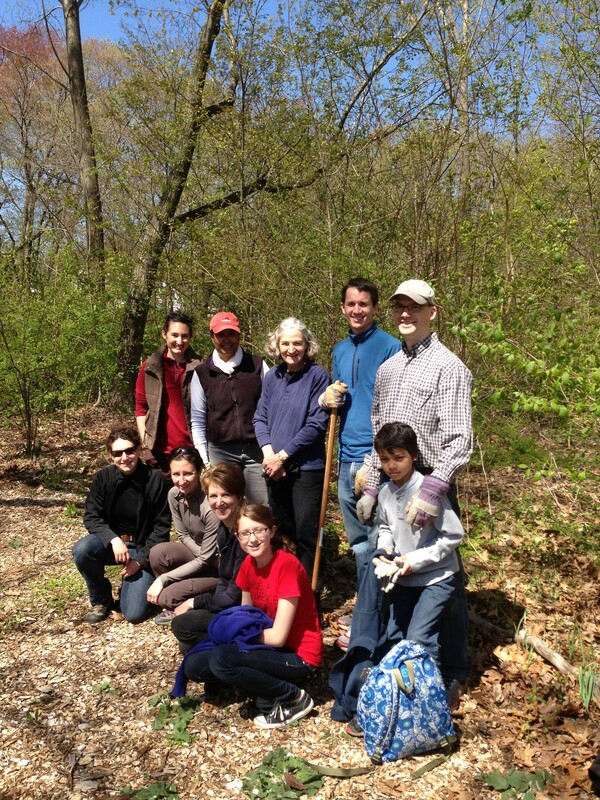 )and her daughter helped clean up Gladeside Urban Wild in Mattapan on May 5th. For more upcoming weekend volunteer opportunities , please contact Katie D’Angelo, Public Service Programs Coordinator, at kdangelo@bostonbar.org. Last week, 41 volunteer attorneys headed to Boston public elementary school and high school classrooms for the annual Law Day in the Schools Program on May 1st, 2nd, and 3rd. 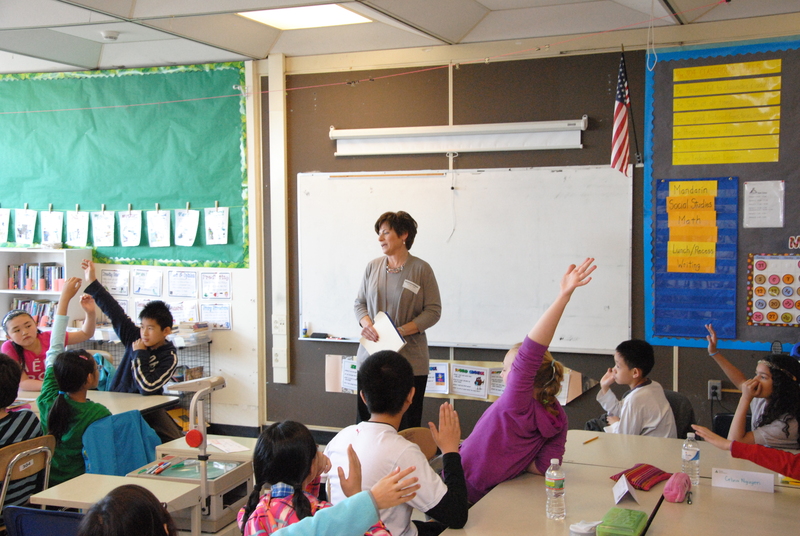 The volunteers taught 782 students in seven Boston public schools about the issue of equality. Lisa Menelly (Raytheon Company) leads Ms. Pearl-Haynes’s 4th grade class at Mozart Elementary School in Roslindale in a discussion about what equality means. I would encourage everyone to volunteer for the Law Day in the Schools. Not only was it personally fulfilling, it was really fun to be in a class where the students were so engaged and excited just to have a “real” lawyer in the classroom – something that’s definitely not a commonplace experience for them. In the class I taught, we went from general themes of equality under the law to a very spirited debate about whether kids should have the right to vote. (Consensus – only if they learn about the issues and don’t just vote for their friends!) It’s a terrific opportunity to inspire the next generation and remind ourselves how lawyers have been and continue to be a positive force for change. – Lisa Menelly (Raytheon Company), Volunteer Attorney for Kimberly Peart-Haynes’s 4th grade class at Mozart Elementary School. I thoroughly enjoyed my participation in Law Day in the Schools. The fifth grade students were smart, engaged, and well behaved. It was a pleasure to hear their thoughts on what “equality” means and how they can help promote equality in their school and community. – Michelle O’Brien (Mackie Shea O’Brien, PC), Volunteer Attorney in Matthew Lyndon’s 5th grade class at Josiah Quincy Elementary School.